Have you ever looked at the number of reviews books receive by their readers? For some of the super-star books, you may find hundreds of reviews. Most, however, have less than a handful. Understandably, most people don’t leave reviews. To be honest, until I started writing, neither did I. It wasn’t until I realized how important a review is to help a potential reader make a good decision about which book to buy that I started doing them. 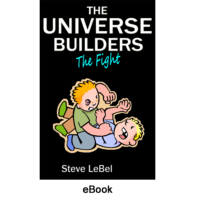 All of this is to explain why I’m so pleased to report The Universe Builders has received its ONE HUNDREDTH 5-star review. It was our 131st review on Amazon, which has been keeping our average up at 4.7 stars out of 5.0. Bernie and I thank you so very much. This entry was posted in Book Awards & Honors, Book Reviews, News. Bookmark the permalink.